Techniques for cleaning a wood floor of animal feces are largely dependent on how much time has elapsed since the "accident," the "consistency" of the feces, and the condition of the finish on your floor. There are cleaning techniques for your wood floor that should work under most circumstances. With patience, and the right tools, feces can be removed from a wooden floor. Put on rubber gloves, if that is your preference, or simply insert your hand into a plastic bag and pick up the feces with the bag. You may also put a couple of paper towels over the feces before picking it up with the bag. Turn the bag inside out, so the feces is inside the bag, tie the bag and throw it away. If the finish of your floor is in good shape and the feces relatively solid, there may be very little residue. Just use a spritz or two of an enzyme-based cleaner, followed by a wipe and quick scrub with a paper towel to get rid of any odor. Note the condition of your floor. If the floor is a little beaten up and the feces has dried or is embedded into the scratches, further action will be needed. Spray the area with the enzyme-based cleaner, wait a minute or two, and then gently use a scrubby sponge or soft brush (you may want to have a special one put aside just for this particular job to avoid spreading germs and odor) to clean the rest of the feces. Spray on more enzyme-based cleaner as needed then wipe up with a paper towel. This may have to be repeated several times to make sure all the feces has been removed. Finally, spray with a little more enzyme-based cleaner and wipe with a paper towel to make sure the smell is gone. 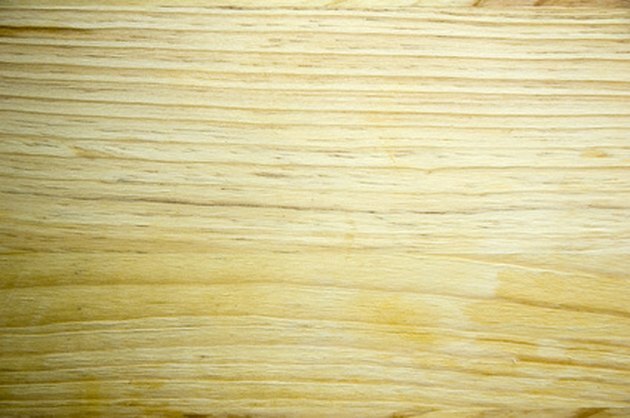 Wait until the stain fully dries before doing anything further if the wood appears to have been stained. You may find the darkening disappears as the wood dries. If not, try gently rubbing a little 3 percent hydrogen peroxide into the stain. Don't use too much; and wait a few minutes between applications to see if the stain is fading. Pete Glaze has written professionally since 1998, with his first work appearing uncredited in books for Trans-Atlantic Publications. He was a staff writer for Remilon LLC and has been published on the Elementary Studio website, along with many others. He has worked as a computer consultant, graphic artist, musician and book designer. Glaze holds a Bachelor of Arts in liberal arts from Fordham University.